Holding nail polish bottle steady and tilted, Grip & Tip nail polish holder prevents spills and helps you reach every drop! Freeing both hands for easy manicures and pedicures, it adjusts to hold bottles of all sizes and shapes—allowing easy, efficient application for nail polish. Plastic. Colors may vary. I use it as often as I can. Not all my bottles fit it, but most do. I like it. I had bought one of these years ago for my Mom. It got lost in her move. I finally found them again and now I want one for me. Makes polishing the nails so much easier to NOT have to fiddle with the bottle. Love my nail polish bottle holder ! It works great ! I don't have to be holding the bottle and this is good, it helps to have my hand free, I think is a great idea. Congratulation for the invention. It could be a couple of dollar less. I definetely recomend this to a friend. I have two of these, and they are great! It's so nice to not have to hold the bottle-it's like having an extra hand! Holds even square bottle. Have only used a couple of times but has worked as advertised. Time will tell if it remains tight to hold bottle. I am happy with my purchase! I realy like the polish holder. It is very hand to use, especially when sitting in my recliner. How did we ever live without this? It works for almost every size bottle so far. I will always keep one now! Very handy gadget. Help with my arthritis. I am always in a hurry when I need to polish my nails. This has been a great time saver since I don't have to try to hold the bottle and paint my nails at the same time! Everyone that saw it ask where I got it. So I bought a bunch for gifts and started handing them out. This gadget is a life saver! Love, Love, Love it! Many angles and great for the bottom of the polish bottle. I gave this as Christmas gifts with nail polish... My girlfriends loved it!!!! So fun! Very helpful when doing your own nails. It's just like having a third hand.I find I have fewer bobos to my wet nails. I sure wish I knew about this holder years ago. I found this product to work great. I read Carol's review and found that if it is angled and tilted properly it works great. Not a drop lost. I use Essie a square bottle and fits fine. Great value.....love it!!! Great if you love doing your nails, you don't have to continually tip the bottle because its already tipped. What a great product.....LOVE IT!! I received one for Christmas, the best gift ever. This product works great! I originally bought it for my 13 year old daughter, but I liked it so much that I bought one for myself. Then my husband started stealing mine and using it in the garage for his projects. So now we all have our own! So handy for many uses! I bought this for my daughter for Christmas, and she loves it! 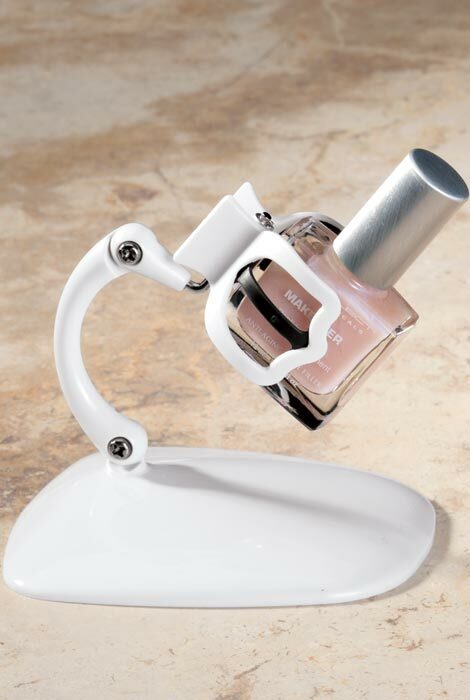 It works perfectly to hold the bottle of nail polish at an angle while you're painting your nails. She even said we should get another one in case we can't find it in the future and want a second one. I really like this gadget. It really keeps the bottles in their positions. I got white and decorated the bottom of it. Really fun, will buy more. This nail polish holder works great! It holds various size bottles securely, and can be adjusted to various angles. I would recommend it to any one! great product, easy to use and ssooooo handy to have. Buying more for gifts. It really helps when you're running low on the polish. You can angle it so it's always excessable, but I wish the screws could be tightened a bit. Doesn't hold at all angles. I bought this as a gift, and the person who received it was pleasantly surprised. She has been using it without a problem. Base could be heavier so it doesn't have to be held down, but very handy just the same. Adjusts for various bottles and angles. Love it.....what I was looking for! I really like this! Although is it light weight it really works well. I place mine on a napkin the put my hand on that. My daughter got creative and decorated the base of it...really cute! May have to buy others for gifts. I really like this product. It has alot of angles to tilt.....really woks well. Finally! I've wished for a gadget like this for years! Can't tell you how often I've turned over a bottle of polish trying to balance the bottle in a cup or something to get that "tilt." My only complaint is that it's not very heavy, so I still have to be careful that it doesn't get knocked over, but I'm thinking of gluing the base to something heavier and wider, like a piece of wood, for more stability. Nice to hold bottle of polish on vanity table while doing nails, but base is too lightweight so it tips and skids. I filled the base with Water Putty, let it dry, then glued rubber shelf lining to the bottom. Now it works much better! Wish it came like that and that the arm was a little sturdier. Tried as a gift for a 85 year old that likes to do her nails. She has arthritis and this may help. Perfect to use for painting my nails. I would have given it 5 stars but it would be perfect if it had suction cups on the bottom. I use this quite often. it is really helpful when there is less then half a bottle of polish. quality is poor for the price. I love the idea of this product. Easy to use in most applications, but is too light weight and tips easily and slides on counter top. Also will not hold all nail bottles, such as square or large. I HAVE PARKINSON'S DISEASE - MOSTLY IN MY HANDS/FINGERS. IT WORKS GOOD AND I DON'T HAVE TO WORRY AS MUCH ABOUT KEEPING MY HANDS STEADY. THE ONLY DRAWBACK IS IT NEEDS TO BE MADE OF HEAVIER MATERIAL, TO PREVENT IT FROM FALLING OVER. I polish my nails and use this product in my bedroom. It seems to "fall over" very easily when touched. So far, the nail polish hasn't fallen but I feel that could happen at any time. It should have a stronger construction that would prevent the nail polish from falling over. I try to be careful and hope it doesn't spill. It's a great idea, but the item should have been constructed better, even with a spill-proof "guard." Its a great idea and works to a degree. But it bends too easily and when you put the nail polish bottle in it doesn't stay upright and tends to tip the polish down too much. Not the best or worst purchase made. I use it for personal manicures and pedicures. It would be a terrific product if there were more weight on the bottom. This is extremely light weight plastic. When I first used it it fell over. The grip part is not bad, then again you need to be careful according to the shape of your bottle and how full it us. Find an item to hold the piece down at the bottom and you should be ok. I feel the price is way too high for the product!!! I found polish bottles to be too heavy and the arm wouldn't hold it up. It wanted to fall down and tip the bottle. The claw is not strong enough either. I couldn't get it to work like the picture shows. Not Impressed. Too light weight for the price. Doesn't hold all shapes of bottles. Too light weight. I wouldn't trust it to keep the polish from spilling. This product looks like it would be so useful when polishing your own nails. Like an extra hand. However, it's too light weight and doesn't stay in place on the counter so it's rather useless. The price on this website was best for this item. Great for using all the nail polish. It's comfortable, if you can keep it.